Jeffrey Scott Skinner (born May 16, 1992) is a Canadian professional ice hockey player for the Buffalo Sabres of the National Hockey League (NHL). He previously played for the Carolina Hurricanes for eight seasons, and was an alternate captain of the Hurricanes during the 2016–17 and 2017–18 seasons. 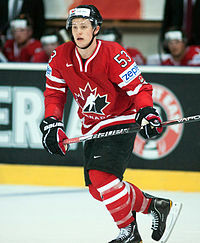 Selected seventh overall by the Hurricanes in the 2010 NHL Entry Draft, Skinner was the youngest player in the NHL during the 2010–11 season and is the youngest player ever to play in the NHL All-Star Game, as well as any All-Star game within the four major North American sports leagues. He won the Calder Memorial Trophy for best rookie in the 2010–11 season, becoming the first Hurricanes' player to do so. Skinner was born to lawyers Andrew Skinner and Elisabeth Campin. He has five siblings, each of whom either are or have been involved with hockey. He is the second-youngest among those siblings, four of which are sisters: Jennifer (a former Harvard Crimson forward); Andrea (a former Cornell Big Red forward and lawyer at Bay Street law firm Aird & Berlis); Erica (current Carleton Ravens defence); and the youngest of the Skinner family, Jillian (currently a defenceman wearing the number 25 for the Mercyhurst Lakers). He also has one brother, Benjamin, who was in the Kitchener Rangers system, but now plays for the Herforder EV in Germany. Skinner attended William Armstrong Public School and then Markham District High School. Involved in both ice hockey and figure skating growing up, he won a bronze medal in the juvenile division at the 2004 Canadian Junior National Figure Skating Championships. Soon after, he made the decision to focus solely on hockey. Skinner played minor ice hockey with the Toronto Jr. Canadians and Toronto Young Nationals of the Greater Toronto Hockey League and the Markham Waxers of the Ontario Minor Hockey Association. He played in the 2005 Quebec International Pee-Wee Hockey Tournament with Markham. Skinner was drafted 20th overall in the 2008 Ontario Hockey League draft by the Kitchener Rangers from the Toronto Young Nationals, where he played on the wing with future Colorado Avalanche captain Gabriel Landeskog. After leading the Rangers in goal scoring in his rookie season, Skinner participated in the 2009 Ivan Hlinka Memorial Tournament, scoring 6 goals for 6 points, while winning the gold medal with Team Canada. In his second OHL season, Skinner scored 50 goals and led all CHL draft-eligible forwards in goal scoring. He became the first Ranger in 23 years to reach the 50-goal milestone. Despite leading the league in goals at the time, Central Scouting ranked Skinner as the 47th best North American skater during their midterm rankings, and only 34th during the final rankings. This contrasted ratings from other organizations such as ISS and TSN's Bob McKenzie who had him much higher. During the 2010 NHL Draft, he was taken 7th overall by the Carolina Hurricanes. During his first NHL training camp, he signed a three-year, entry-level contract with the Hurricanes on September 21, 2010, worth $2.7 million. On October 7, Skinner made his NHL debut with the opening roster in the Hurricanes' 4–3 win against the Minnesota Wild during the NHL Premiere Series in Helsinki, Finland. In 16 minutes of ice time, he had two shots. The following day, Skinner recorded his first career NHL point with an assist on Tuomo Ruutu's goal. He also scored the game winning shootout goal to become the third-youngest player in NHL history to score a shootout goal. On October 20, Skinner scored his first NHL career goal against Jonathan Bernier of the Los Angeles Kings in his fifth game of the season. At the NHL Awards ceremony on June 22, 2011, in Las Vegas, Nevada, Skinner was awarded the Calder Memorial Trophy as the NHL's top rookie, beating-out fellow rookies Logan Couture of the San Jose Sharks and Michael Grabner of the New York Islanders. At that time, he was the NHL's youngest player as well as the first Hurricanes player to ever win the Calder. On December 7, 2011, Skinner was diagnosed with a concussion after a game in Edmonton. He returned to the Hurricanes lineup after missing 16 games on January 5, 2012. Skinner was suspended for two games after kicking Scott Nichol of the St. Louis Blues during a game on March 15, 2012. On August 7, 2012, Skinner agreed to a six-year contract extension worth $34.4 million which would keep him under contract until the 2018–19 season. On February 14, 2013 Skinner was diagnosed with an upper body injury, later deemed a concussion, after a game in Toronto. On December 4, 2013 Skinner earned his first career hat trick against the Nashville Predators. On October 6, 2014, Skinner sustained a concussion on a hit from Washington Capitals defenceman Matt Niskanen. Skinner was named alternate captain of the Hurricanes for the 2016–17 and the 2017–18 seasons. On August 2, 2018, after eight seasons with the Hurricanes, Skinner was traded to the Buffalo Sabres in exchange for Cliff Pu, a second-round selection in the 2019 NHL Entry Draft and a third- and sixth-round pick in the 2020 NHL Entry Draft. In November 2018, Skinner became the second player in Sabres' history to score 20 goals before December, and the seventh player to score at least 20 goals in less than 27 games. On April 6, Skinner scored twice in the season finale against the Detroit Red Wings, upping his total to 40 goals scored on the season, the first time in his career that he has reached that mark. Calder Trophy winner as best NHL rookie during the 2010–11 season. ^ "2010 NHL Entry Draft". NHL. June 25, 2010. Retrieved June 25, 2010. ^ Jeff Hicks (September 22, 2010). "Jeff Skinner and the $2.7M 'light breakfast'". Kitchener Record. Retrieved October 21, 2011. ^ "Women's hockey roster". Archived from the original on November 3, 2009. Retrieved February 2, 2011. ^ "Mercyhurst University Women's Ice Hockey Roster". Retrieved November 18, 2014. ^ "Ice Dragons verpflichten neuen Kontingentspieler!". Retrieved March 3, 2019. ^ "Skinner gets No. 50". The Record.com. March 13, 2010. Archived from the original on April 25, 2012. Retrieved October 21, 2011. ^ Chris Robinson (September 21, 2010). "Hurricanes Sign Skinner to Entry-Level Contract". NHL.com. ^ Kimelman, Adam (October 7, 2010). "Six from 2010 Draft class make opening-night cut". NHL.com. Retrieved October 7, 2010. ^ Martin Jones (November 11, 2010). "Carolina Hurricanes Report: Skinner, Staal Lead Sudden Goal-Scoring Explosion". Bleacher Report. ^ "Canes' Skinner gets first NHL goal". NHL.com. October 21, 2010. Retrieved February 19, 2018. ^ "Hurricane's Jeff Skinner sets mark as youngest-ever All-Star". The Mercury News. January 30, 2011. ^ Preston, Ken (February 2, 2011). "Skinner Named NHL Rookie of the Month for January". NHL.com. Carolina Hurricanes. Retrieved February 19, 2018. ^ "Hurricanes forward Jeff Skinner claims Calder Trophy as rookie of the year". NHL.com. June 22, 2011. ^ Ken Preston (June 22, 2011). "Canes Forward Jeff Skinner Wins Calder Trophy". NHL.com. ^ "Carolina's Jeff Skinner activated after missing 16 games with concussion". NHL.com. January 5, 2012. Retrieved February 19, 2018. ^ Sean Leahy (March 16, 2012). "Hurricanes' Jeff Skinner given 2-game suspension for kicking Scott Nichol". Yahoosports. ^ Michael Smith (March 16, 2012). "Skinner Suspended for Two Games". NHL.com. ^ "Skinner, 'Canes agree on 6-year extension". NHL.com. August 8, 2012. Retrieved February 19, 2018. ^ "Carolina says forward Jeff Skinner has concussion, lists him as day to day". NHL.com. February 20, 2013. Retrieved February 19, 2018. ^ "Jeff Skinner records first career hat trick". theScore.com. December 5, 2013. ^ Peters, Chris (October 6, 2014). "Jeff Skinner sidelined indefinitely with concussion". CBSSports.com. Retrieved October 10, 2014. ^ "Jeff Skinner nets a hat trick, Hurricanes beat Ducks". Sportsnet. December 12, 2015. ^ "Hurricanes winger Jeff Skinner earns second hat trick in three games". Sports Illustrated. December 15, 2015. ^ "Skinner leading candidate to be Hurricanes' next captain". NHL.com. September 22, 2017. ^ Morton, Kyle (October 5, 2017). "Hurricanes Name Jordan Staal and Justin Faulk as Co-Captains, Jeff Skinner as Alternate". Canes Country. Retrieved December 12, 2018. ^ Williams, Terrell (August 2, 2018). "Canes Deal Skinner to Sabres for Picks, Prospect". NHL.com. Retrieved August 2, 2018. This page was last edited on 15 April 2019, at 00:50 (UTC).